On a whim, I walked my circuit in the opposite direction today, for the third time in 16 years. 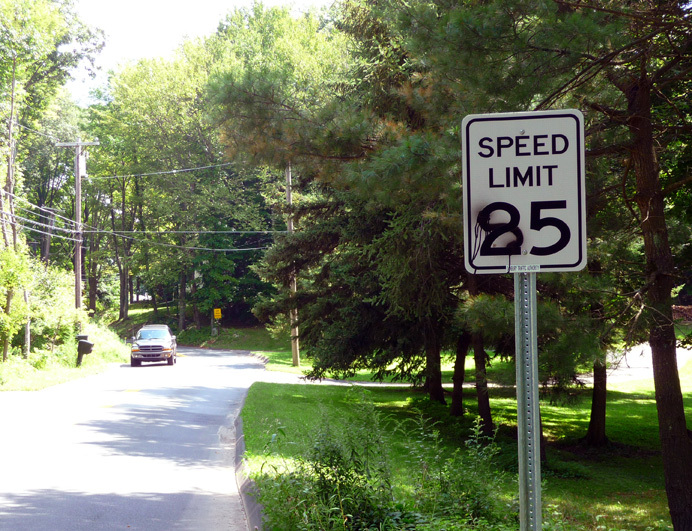 I had never noticed this altered speed-limit sign, because I always saw its back side. Maybe it's been like this a long time. I found the walk less picturesque than usual, but I can't decide whether that is because it presents inferior vistas or because truly appreciating a scene requires years of familiarity. Would the Mona Lisa seem less beautiful if it were unveiled tomorrow? I solved yesterdays' crocodile mystery by walking around the pond today and snapping this side view. Sure enough, the "crocodile" is only a concrete replica—and the object protruding from its head is a baby croc riding on its back. Why had I never noticd this piece of sculpture before? Maybe the pond level has dropped, exposing what used to be submerged. Or maybe I'm just not as observant as I thought. .